Sharing his expertise - Quantum Sails Annapolis' new Loft Service Manager and sailing expert Wojciech "Bary" Dlugozima is excited to use his talents to support the Annapolis sailing community. Quantum Sails is excited to announce the addition of Wojciech “Bary” Dlugozima, Emre Kalaycioglu, and Alan Woodyard as the new Loft Service Managers in Annapolis, San Francisco, and Seabrook. Spencer Colpaert also joins the Quantum Sails Newport loft as a Sails and Service Consultant. Their extensive knowledge and experiences will continue to help Quantum provide the high-quality service their customers have come to expect. Dlugozima’s sailing career started in elementary school. Since then, he’s competed in and won several national championships in various Olympic classes, and has worked as the technical team leader and project coordinator for the Race 2000 Association. Most recently he served as the shore team advisor for the Paszke 360 team. His career includes work as a yacht captain, project leader, Bosman, and boat builder, as well as the Admiral’s Cup Champion with Team USA and the ILC 40 European Champion. He joins the Quantum team in Annapolis as the Loft Service Manager. National Service Director Charles Saville said Quantum is excited to have someone with Dlugozima’s level of professionalism and commitment in the department. “It’s like having Derek Jeter help coach a high school baseball team,” said Saville. “It’s virtually unheard of having someone this highly skilled and successful running a service loft.” With Dlugozima’s extensive list of experiences, he’s been almost everywhere and tried almost everything. He understands how people tend to use and abuse their sails, and he knows how to provide the best service in each situation. “My knowledge of sailing, sails, and boat types, and knowing the sailing environment, are crucial to success in a position like this,” said Dlugozima, adding that his goal is to assist and help educate sailors so they can make the most of their sailing experiences. At the Quantum Pacific loft in San Francisco, Emre Kalaycioglu will take over as Loft Service Manager. A sailor since he was eight, Kalaycioglu started in the Opti class and worked his way to larger boats, sailing on and winning championships on several large yachts. Sailmaking always piqued his interest though, and he visited his first loft when he was a teen, curious to know how sails were made and repaired. Saville said Kalaycioglu bleeds Quantum green, and he was happy to have him take over at the Quantum Pacific loft. “His passion is infectious and spills into everything he touches,” said Saville. “Our clients love him and his passion for sailing and sailmaking. And at the Quantum Gulf Coast loft in Seabroox, Texas, Quantum welcomes another new Loft Service Manager in Alan Woodyard. Woodyard didn’t start sailing until he was 21 years old, but once he discovered the thrill of life on the water, he pursued it with a passion. He attended the Chapman School of Seamanship before pursing long-distance cruising sailing as a live-aboard crewman. It was during one of those live-aboard experiences that he knew he’d found his career. “I was exposed to every facet of boat maintenance, refitting, and outfitting that can occur on an average yacht, and I loved the process, the constant education of it, and the satisfaction derived from a completed project or improvement,” said Woodyard. One such project was fabricating new hatch covers, which started him on the path to sail lofts and sailmaking. When he heard about an opportunity to work in a Quantum loft, he jumped at the opportunity. “Quantum is a great company. Literally everyone – from the collegiate sailor working in the loft for the summer to the CEO – has a passion for the marine industry and an expertise gained from real experience,” said Woodyard. After working in the Quantum Annapolis service loft, he’s ready to manage the floor at the Seabrook loft. Recently joining the Newport loft as a Sail and Service Consultant is Spencer Colpaert. Colpaert who is originally from Grosse Point, MI has been sailing his entire life and was active in his local junior sailing programs before taking a major interest in match racing. He has eight years of match racing experience, including two years racing with Riptide Racing – top ranking at 19th in the world and 1st in United States. Aside from match racing, Colpaert also has experience racing on several different boats including Melges 24s and Farr 40s. 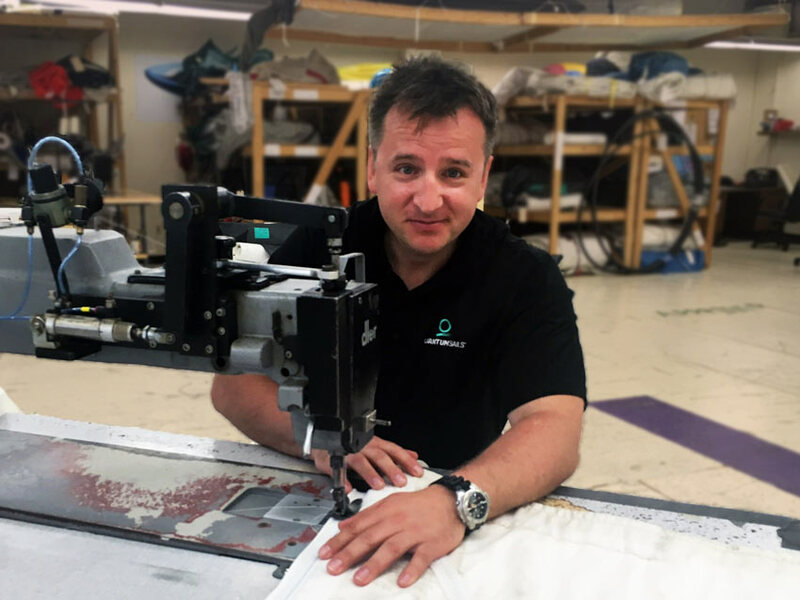 Before joining the Quantum Sails Newport team, Colpaert spent three years as a sailmaker in Detroit and trained with Saville in Annapolis for four months. “It’s great how Quantum has given me the tools and resources to really expand and grow," said Colpaert. "It has been exciting to learn from everyone in the company. No one, from local office managers and service technicians to people like Scott Nixon and Terry Hutchinson, has hesitated to provide advice and guidance along the way." Click here to find your local Quantum loft.